In my books I write about the ‘Between’ the place that exists outside our limited view of the world. If everything is now, then the idea that time is a straight line from A to B rather falls through the cracks doesn’t it? Time as a continuum has no straight lines just beautiful curves and twists that spread out through the “Between.” If we can find the right swatch or ‘skein’ of threads, then we can give them a little tug, to tangle or untangle, bits of ourselves that have fallen through the cracks, as it were; the little pieces that we have known are missing from our psyche. We are governed by the store of images and symbols that allow us to connect the dots when they are triggered. “Once upon a time” for instance, everyone immediately recognises as a commencement to a story and shifts perhaps, in their mind to a rainy day by the fire with a good tale or a favourite yarn told as a bedtime treat. My characters wrote themselves with the help of the most predominant voice and images in my head, namely Silver. I call her my true self, my wiser self and it’s through her that these books came about. To wake with a song line ready to write down or a twist in the plot, unfathomable before sleep, is a gift indeed. As a Hedgewitch, a Pagan, I respect the otherworldly influences that can make a somewhat complex process a little simpler. Previous Post…Grey Weavings….Book 2 In the series Silver’s Threads Next Post…I always feel a little blue ! 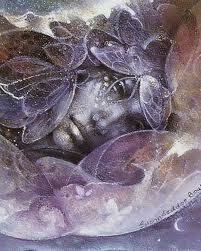 Your writing Penny, has created a shift in my thinking, my imagination, my view of Mother Earth in all her complexities. These days I feel a strong & growing connection with Her, Her pains, joys, longings & mysteries. I thank you for stirring that in me. I only wish others experience the growth in spirit & understanding bought on by your writings. So Mote it Be!